As Convergence gets ready to turn the world of DC Comics upside down and The Flash begins experimenting with travelling back and forth in time on TV, it feels like a big time for DC's take on time travel. But really, time travel has been a crucial part of the way DC has structured its comics for decades. Essentially, so your brain doesn't leak out of your ears trying to grasp all the vagaries of various time travel arcs across the history of DC, it's easier to understand the way DC creators have used time travel over the years not as simply sliding back and forth across a single timeline. That kind of time travel is relatively simple in the DC Universe. Advanced time travel ,however, is essentially the crux at which the various states of the DC Multiverse over the years hangs itself: alternate worlds are born of alternate timelines, and travel between the various numbered Earths over the years. It's less about reality hopping and more about bending the fabric of time to transpose yourself into another timeline. To understand time travel as a concept in DC's history is essentially to understand how the Multiverse has expanded and contracted over the years. Simply put, from a metatextual level, time travel is an excuse often an excuse for alternate stories featuring familiar DC heroes, and over the years, the chance to reboot continuity. The DC Multiverse, and thus the role of time travel in DC comics, has waxed and waned over the years of the companies' existence — the more prominent the existence of alternate worlds, the more likely time travel stories are going on. Here's a brief recap of how time travelling shenanigans have torn down and reshaped the DC Comics universe over the years. In the earliest days of the comics, outside of crossover series like Justice League, DC's universe wasn't exactly cohesive and connected. You had the splits between the Golden Age and Silver Age versions of their stalwart characters already creating a continuity mess, but in reality writers and editors didn't really care - each standalone series essentially sat in its own bubble, adventures only effecting each other as and when required, rather than huge ramifications playing out across multiple series as you might expect with a comic event today. Amid these various continuities and canonical disputes, there emerged perhaps the DC Universe's premiere time traveller (at least, in terms of the mainstream heroes): Barry Allen, a.k.a The Flash. 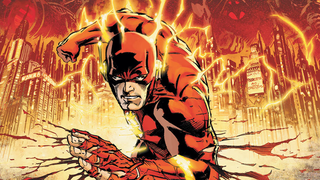 Barry's connection to the speed force, and his ability to race around at almost seemingly infinite speeds, played naturally into the character's move into time travel. In 1961, the character's iconic 'Cosmic Treadmill' was introduced, and Barry began to use his speed to combat enemies not just in the present, but in the far future of the 30th Century. In the early days of the '50s and '60s, time travel was a simple concept for writers: A single stream, and effects on the past changed things in the future. But as the DC Comics world expanded and expanded, and the desire to knit things together grew, these once standalone series and spinoffs and what ifs all slowly started to merge and link into what would become the first take on the Multiverse. But instead of worlds co-existing, DC's Multiverse essentially relied on disparate timelines to connect itself all together — different events throughout history formed alternate worlds and existences on separate timelines, and Time travel would be used to hop between those worlds, rather than any other sort of explanation. Eventually, it became too much for DC to handle: There needed to be a way to wipe the slate clean again, and despite time travel essentially being what created the problem in the first place, time travel would be used to solve it. Crisis on Infinite Earths had a monumental impact on the DC universe in the mid-80's. We've already discussed how the event was used to revert Superman's power level to a more believable level, but its main impetus was to act as hard reboot of the DC timeline. The plans of the Anti-Monitor ultimately slashed the number of remaining 'Earths' in DC canon down to five, before ultimately, through the heroes and villains uniting to stop the Anti-Monitor by travelling across the stretches of time to stop his plans from even happening — and Barry Allen perishing to stop Anti-Monitor from destroying the remaining Earths — saving the day at the cost of merging the remaining five Earths into a singular amalgam: a new earth, and a new reboot for the DC timeline. Post-Crisis also put a soft limit on time travel for DC's writers - with the new universe largely free of alternate timelines with the reboot, DC were hesitant to let it things get out of hand again. There was an unspoken rule put in place to try and limit the amount of what-ifs and alternate realities that lead to Crisis in the first place: A character could only time travel a handful of times, before the stress of attempting to jump through time would destroy their bodies. But as time passed after Crisis, and the DC Universe began to re-expand itself, writers began to find away to expand into the multiverse once more. The main example of this semi-aborted attempt to recreate the multiverse came in 1999, when writers Grant Morrison and Mark Waid coined the concept of 'Hypertime'. Morrison and Waid subscribed to the belief that, as far as DC Canon was concerned, everything was true and everything mattered (not to dissimilar to Disney's current approach to the new Star Wars universe). Alternate realities and different interpretations of DC's characters could exist alongside the 'canon' heroes of Earth-1, designated the 'main' timeline, as different splintered branches from the source, which was collectively known as 'Hypertime', introduced in the comic book arc The Kingdom. But outside of the fiction, Hypertime was essentially a handwavey way to approach telling alternate stories - only a few heroes of the central Timeline would ultimately be aware of Hypertime and its branching existence at the end of the events of The Kingdom - and the way Morrison and Waid intended for the concept to weave a single timeline and its branches in and out of each other was met with stark disapprovement from other DC writers. As the pair stepped away from DC for extended periods to work with other companies, Hypertime was essentially sidelined and ignored by DC, until they flat out disavowed its existence in 2005. In short time though, time travel and the multiverse concept would come to a head again, Hypertime be damned. Infinite Crisis, a 2006 semi-sequel to the events of Crisis on Infinite Earths, saw the alternate Alexander Luthor - who had survived the events of the first Crisis - reattempt to create the original Multiverse timeline, and acted in a similar capacity as a reboot of the DC Timeline, but on a far less extensive scale. During the story, Luthor originally succeeds in re-expanding the single Post-Crisis Earth into several alternate realities once more, before being undone and re-slammed together as 'New Earth'. This impacted on the main timestream of the DC canon in various ways, but nothing as earth-shattering as the first Crisis - certain characters like Jason Todd were brought back to life (despite their deaths being remembered), and disparate origins for heroes were all merged into one existence. The soft reboot would only last for 6 years though. Unbeknownst to the heroes of New Earth, Luthor's attempt to recreate the different timelines actually worked. Little by little, branches off the timeline started to bleed out, forming a new Multiverse of 52 Earths: each very similar to New Earth, but then ripples in Time diverging them into the alternate timelines they would come to be known as. But once again, this all changed - and once again, it was down to the efforts of the Time Travelling Barry Allen. 2011's Flashpoint, set in an alternate timeline created by the Reverse-Flash, Eobard Thawne, saw Barry trapped in a reality he couldn't remember - a quasi-apocalyptic existence where war between the Atlanteans and the Amazonians was tearing the planet apart. Thawne eventually revealed this timeline was brought about by Barry himself, in an attempt to travel back in time and save his mother Nora from the Reverse-Flash (a story we're currently seeing play out on The Flash TV show, essentially). Barry once again has to use his speed to revert the timeline, but in the process, actually recreated the DC universe once more. Three disparate timelines, the DC Universe, the Vertigo Universe, and the Wildstorm Universe - a.k.a, the three imprints DC Comics were currently running - were merged into a single Universe: The New 52. This new reality, at first met with great hostility by DC fans, created a new slate of 52 Earths, but unlike before, contact between them and the main, Prime Earth that much of DC's comics currently take place in was restricted - Time Travel between the earth's is currently much more strongly inhibited, with communication and travel between the worlds restricted (and, in a slightly bizarre metatextual manner, can only be conducted through comic books in each Earth retelling the adventures of other Earth timelines). This though, will soon change, with DC's new Convergence Event setting the stage, 30 years after Crisis, to throw the current timeline asunder. Supervillain Braniac, outside of Space and Time, plans to pluck various worlds and timelines from throughout DC's entire history, including pre-crisis events, and throws them all together for fun. Time Travel. It can never be simple, can it?